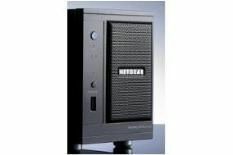 Netgear Readynas Duo review | What Hi-Fi? This Netgear has two hard disk bays, allowing you to add a second 500GB hard disk for back-up or expansion to 1TB. It also has three USB ports, so you can add another external drive and a printer, and still keep the front slot available for easy transfer from things such as USB sticks. This is the only device here that gave us problems at set-up, and technical support was pretty poor, too. Once up and running, however, the Netgear is a quiet and efficient operator. The problem is that, at 48p per gigabyte, storage here is fairly pricey compared with the rest of the competition.